Format: Full color Paperback book (278 pages). 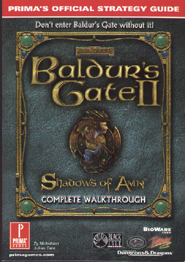 This official strategy guide provides hints on the Baldur's Gate II - Shadows of Amn computer game by Interplay Productions. 'Inside, you'll find that we've taken every aspect of this huge and complicated game and put it onto the very pages before you. We're there to help you through every step of the way, from tips and tactics, to item lists, to walkthroughs of every level - you'd be lost without it. The sections in this guide have been broken down for your ease and reference, allowing you to access sections as and when you need information. Prima's Official Strategy Guide for Baldur's Gate II not only works as a source of quick reference information but also details every part of each level in a complete walkthrough of the game chapters. For example, Chapter 1 in this guidebook corresponds to Chapter 1 in the game, all the way through to Chapter 7. Make use of the Stronghold Plots section as you play through each character class, to achieve the best possible results for you and your party. You will have to make many choices in order to be successful and prosperous, and this section offers sound advice to achieve these ends. And when you meet adversaries along the way, refer to the Bestiary section for essential information including each monster's strengths and weaknesses, armor class and special attacks. The Items Lists section of the guide boasts quick-reference tables that provide detailed information on each item or weapon at your disposal. There's no doubt you'll soon have several pages dog-earer to help you flip back and forth between the sections covered in this book. 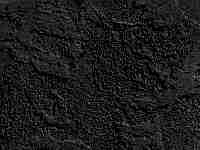 Just like the characters of Baldur's Gate II, this guide should be well worn by the end of your adventure! '.